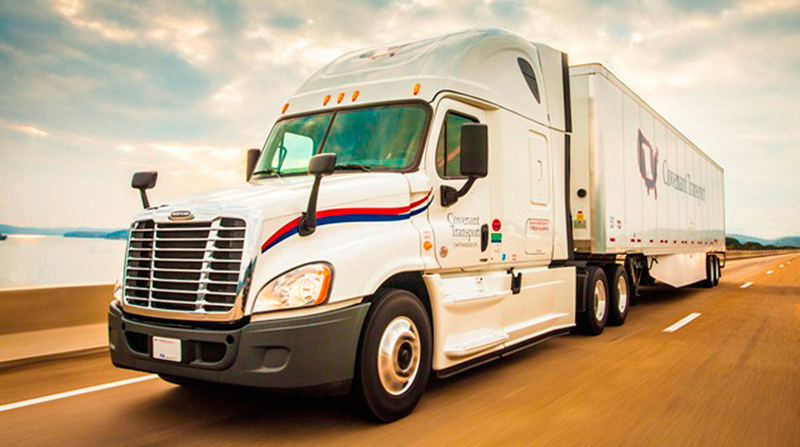 Covenant Transportation Group reported record revenue and profits in the fourth quarter of 2018 as strong demand and higher rates boosted its truckload and freight brokerage business units. The Chattanooga, Tenn.-based company said net income was $16.5 million, or 89 cents a share, in the three months ended Dec. 31, compared with adjusted net income of $9.2 million, or 50 cents a share, in the same period a year ago. Revenue was $272.3 million in the fourth quarter of 2018, up 33.9% from $203.3 million in 2017. CEO David Parker said the company has shifted the focus from more volatile spot market freight to longer-term contractual business. In July, Covenant acquired Landair Holdings, a Greenville, Tenn.-based dedicated contract carrier and warehouse operator, which added 430 tractors to Covenant’s truck fleet and contributed $19.2 million in freight revenue in the fourth quarter. Average freight revenue per tractor per week increased 1.7% to $4,304 in the fourth quarter of 2018 from $4,234 in the same period a year ago. Covenant ended the year with 3,154 tractors, a 23.3% increase compared with 2,559 at the end of 2017. Covenant cut back on its use of team drivers, with the number of team-driven trucks averaging 866 in the fourth quarter, compared to 912 in the same period in 2017. The company also managed to reduce the number of trucks idled because of a lack of drivers, lowering the average percentage of unseated trucks to 3% in the fourth quarter of 2018 from 5.2% a year ago. Looking ahead, Richard Cribbs, executive vice president and chief financial officer, said Covenant expects to take delivery of 1,150 new company tractors in 2019 and dispose of about 1,050 used tractors, increasing its overall tractor fleet between 1% an 4%. For the full year, Covenant said it earned $42.5 million, or $2.30 a share, on revenue of $779.7 million in 2018. That compared with net income of $55.4 million, or $3.02 a share, on revenue of $705 million in 2017. Results in 2017 include a one-time benefit of $40.1 million, or $2.18 a share, from the Tax Cuts and Jobs Act. Covenant ranks No. 47 on the Transport Topics Top 100 list of largest for-hire carriers in North America and No. 18 on the TT list of top for-hire carriers in the truckload/dedicated sector.